Set the engine to TDC. 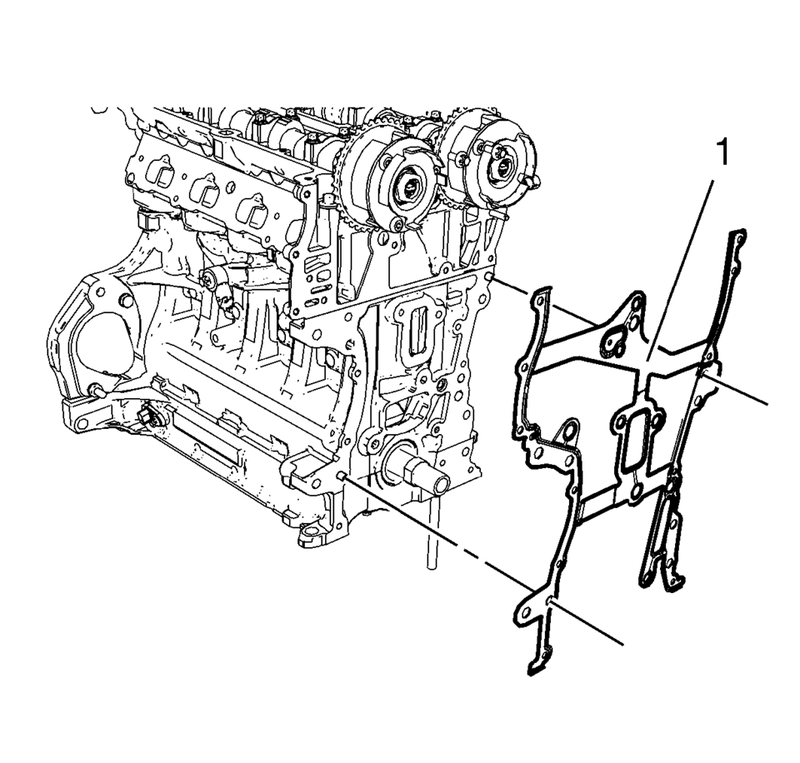 Refer to Camshaft Timing Chain Inspection. Remove the front wheelhouse liner extension, right side. Refer to Front Wheelhouse Liner Inner Front Extension Replacement. Remove the air conditioning compressor bracket. Refer to Air Conditioning Compressor Bracket Removal. Remove the oil pan. Refer to Oil Pan Replacement. Remove the generator from above. Refer to Generator Replacement. Remove the water pump pulley and the water pump. Refer to Water Pump Replacement. Remove the camshaft position actuator solenoid valves. Refer to Camshaft Position Actuator Solenoid Valve Removal. Loosen the camshaft sprocket bolts until the camshaft position exciter wheels are free to rotate. 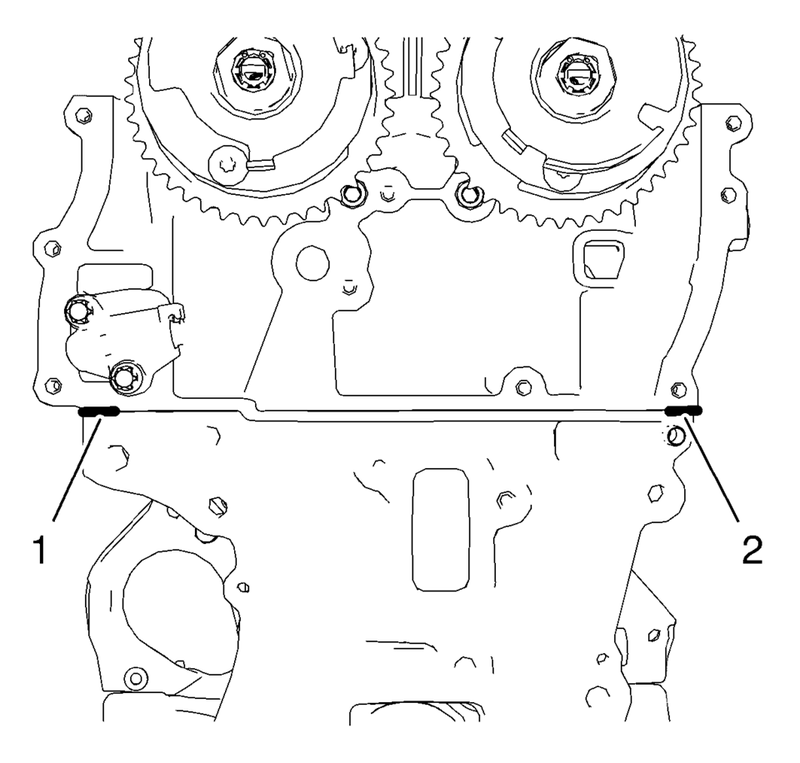 Refer to Camshaft Timing Chain Adjustment. Remove the 13 engine front cover bolts M6 (1). Remove the 2 engine front cover bolts M10 (2). Remove the engine front cover (3). Removal of timing chain is necessary to get access to engine front cover gasket. Remove the camshaft timing chain. Refer to Camshaft Timing Chain Replacement. Remove the engine front cover gasket (1). Remove the intake and exhaust camshaft position sensors from the engine front cover. Refer to Camshaft Position Sensor Replacement. Install the intake and exhaust camshaft position sensors to the engine front cover. Refer to Camshaft Position Sensor Replacement. Clean the engine front cover sealing surfaces on engine block and cylinder head. Apply sealing compound to the shown areas (1) and (2). Refer to Adhesives, Fluids, Lubricants, and Sealers. Install a NEW engine front cover gasket (1). Install the timing chain. Refer to Camshaft Timing Chain Replacement. Mind the guide sleeves when installing the engine front cover. The complete installation procedure of the engine front cover should not take longer than 10 minutes. Install the 13 engine front cover bolts M6 (1). Install the 2 engine front cover bolts M10 (2). Engine should be adjusted and fixed in TDC position. Tighten the camshaft sprockets, install the upper timing chain guide and remove all special tools. 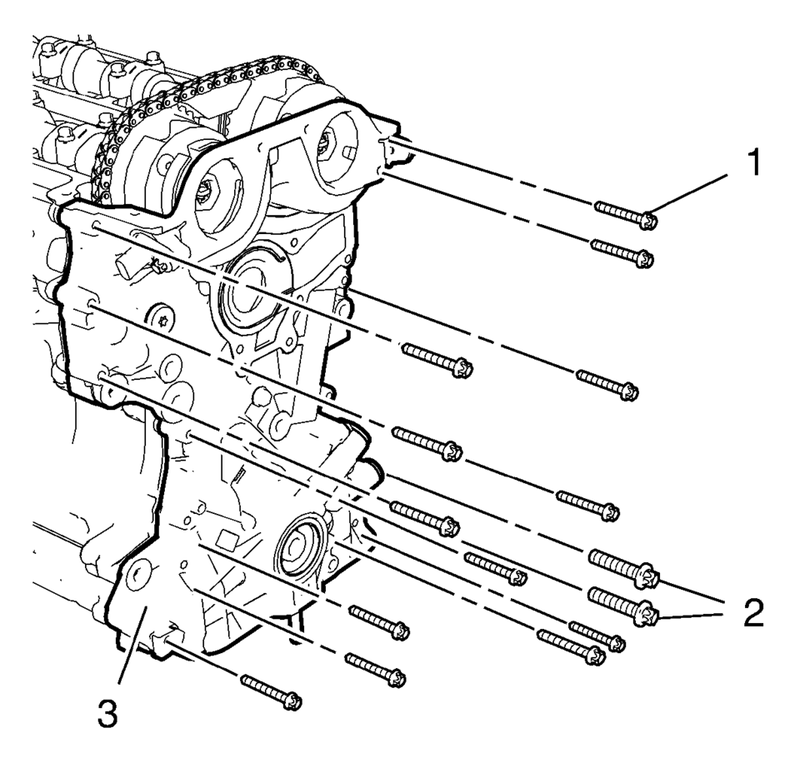 Refer to Camshaft Timing Chain Adjustment. Install the 2 camshaft position actuator solenoid valves. Refer to Camshaft Position Actuator Solenoid Valve Replacement. Install the water pump and the water pump pulley. Refer to Water Pump Replacement. Install the generator from above. Refer to Generator Replacement. Install the air conditioning compressor bracket. Refer to Air Conditioning Compressor Bracket Installation. Install the air conditioning compressor. Refer to Air Conditioning Compressor Replacement. Install the crankshaft balancer. Refer to Crankshaft Balancer Replacement. Install the engine mount. Refer to Engine Mount Replacement - Right Side. Install the camshaft cover. Refer to Camshaft Cover Replacement. Install the oil pan. Refer to Oil Pan Replacement. Install the front wheelhouse liner extension, right side. Refer to Front Wheelhouse Liner Inner Front Extension Replacement. Fill up engine oil. Refer to Engine Oil and Oil Filter Replacement.